Texas officeholders are immune to national politics. One reason Texas Republicans are so sanguine about Donald Trump — who seems to be panicking some members of his party in other parts of the country — is that few of them are in trouble. They don’t live in an area prone to political tremors, and that’s why there wasn’t a huge reaction from the state’s officeholders when Trump made a late-August visit to raise money and hold rallies in Texas, as he did this week in Fort Worth and Austin. Some Texas pols showed up, some didn’t. Most of them can make those decisions without affecting their political fortunes here. It simply doesn’t matter on Election Day. For all of the talk about how Trump might hurt the chances for other Republicans on the ballot, Texas conservatives don’t seem all that worried. It’s because they’re on safe political ground. Even if there’s an earthquake coming, most are so well protected from competition that Trump poses no threat. The Texas delegation in the U.S. House has 36 members, including 25 Republicans and 11 Democrats. In 2012, Democrat Barack Obama got more than 55 percent of the vote in 11 of the districts. Republican Mitt Romney got 55 percent or more of the vote in 24 of them. In CD-23, Texas’ only swing district, Romney got 50.7 percent of the vote and Obama got 48 percent. The numbers were roughly the same in 2008. Obama got 55 percent or more in 11 districts, while Republican John McCain received at least 55 percent of the vote in 24 of them. Trump would have to completely collapse to endanger the chances for any of those 24 Republicans. Rep. Will Hurd, the San Antonio Republican in that swing district, was going to have a tough race no matter who got the GOP nomination; that’s the nature of that district. Some of the districts are even more lopsided. In nine of the seats held by Democrats, Obama got more than 60 percent of the vote. The same is true on the other side for 16 Republicans. Two members of the Texas delegation — Mac Thornberry, R-Clarendon, and Eddie Bernice Johnson, D-Dallas, represent districts where their party’s presidential candidate got four of every five votes in 2012. The Texas Legislature is insulated the same way. In the 150-member Texas House, 88 Republicans represent districts where Romney got 55 percent or more of the vote in 2012. On the other side, 50 Democrats represent districts where Obama got 55 percent or more. That’s 138 of 150 districts where the minority party’s voters — whether they are Democrats or Republicans — are virtually powerless. Trump has said he thinks the political system is rigged. He may be on to something, at least in Texas. The statewide officeholders are protected, not by legislator-drawn maps but by Texas’ strong red streak. Romney’s 2012 performance varied greatly from one district to another, but he handily won the state with 57.1 percent of the vote. McCain got 55.4 percent in 2008. The last real nail-biters on the statewide ballot were nearly two decades ago. Most of those statewide offices in Texas aren’t on the ballot this year, and in spite of the elected class’s general skittishness about the national ticket, it’s hard to imagine Trump’s 2016 campaign having much effect on their future chances (although a Trump Administration certainly could). Whether they swarm their candidate, like Lt. Gov. Dan Patrick and former Gov. Rick Perry, or find other things to do, like Gov. Greg Abbott and House Speaker Joe Straus, has more to do with personal politics than with elections. It matters in other states, where competition is viable and the voters are judging candidates, in part, by the company they keep. In Texas, where few state elections are competitive in November, candidates and officeholders can keep whatever political company they choose, without worrying much about what voters will think. The election results will be about the same whether their voters like it or not. 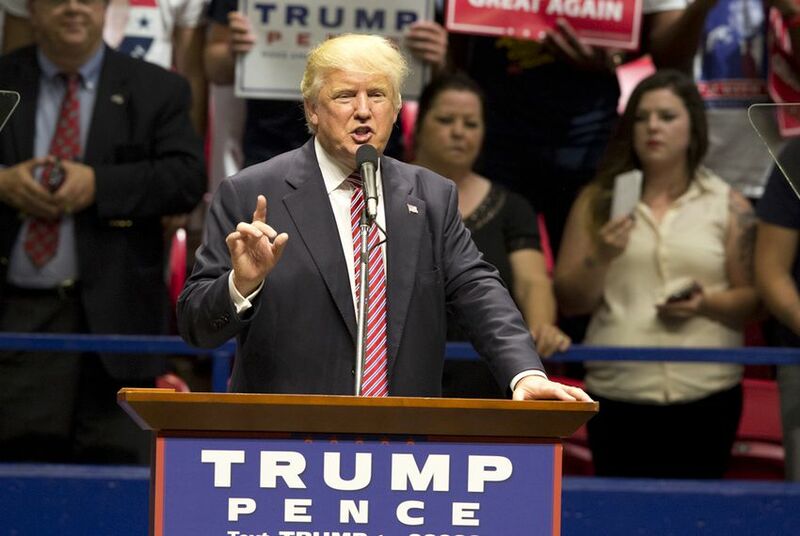 Donald Trump, the Republican presidential nominee who is trailing in national polls and in important swing states around the country, decides Austin, Texas, would be a great place for a general election rally. Go figure that one out. Ted Cruz and Rick Perry are well known across Texas, able to raise money inside and outside of the state and demonstrably ambitious. The speculation about a 2018 matchup will probably come to nothing, right? The state of Texas might let political radio ads run without sponsorship disclosures, but the Federal Communications Commission won’t. And they’ll hold the radio stations to it, if not the campaigns.